Rashtriya Madhyamik Shiksha Abhiyan (RMSA) has issued notification for the recruitment of Project Co-ordinator, District Co-ordinator, Assistant Project Co-ordinator posts. 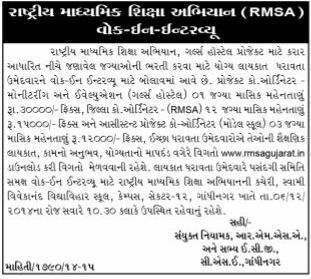 Eligible and Intrested candidates may attend walk in Interview at Rashtriya Madhyamik Shiksha Abhiyan (RMSA), Education Councils & Boards Office, Gandhinagar, Gujarat on 06-12-2014. Reporting time is 10.30 am. More details like post name, age limit, educational qualification, pay scale, selection process and how to apply are given below. The applicant are advised to Kindly visit official website www.rmsagujarat.in for future details.